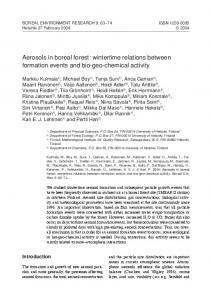 forest: wintertime relations between formation events and bio-geo-chemical activity. Boreal Env. Res. ... carbon dioxide uptake by the forest. However, increased H2O .... regulated by a mass flow controller. This keeps .... event (mol cmâ3 sâ1) . Maarit Raivonen2), Veijo Aaltonen3), Heidi Adler4), Tatu Anttila3),. Verena Fiedler1), Tiia .... with infrared absorption analysers (Hartmann &. Braun URAS 4). Oct 24, 2005 - Atmosphere Relations) research program and also related future views. The main ..... mann C., Moors E.J., Granier A., Gross P., Jensen N.O.,. 1985, Stearns 1986, Napp et al. 1988, Fragopoulu and Lykakis 1990), the size of the food particles and the grazers (Bautista and Harris 1992, Morales et al. Feb 26, 2010 - hans tÃ¸mmervik1). 1) Norwegian Institute for Nature Research (NINA), The ...... busk- og bladlav. Universitetsforlaget, Oslo. Kuusinen M. 1996.
and Liu 2000). The dominant stand contained only 1% of species other than Scots pine: downy birch (Bet- ula pubescens Ehrh. ), grey alder (Alnus incana. Oct 24, 2005 - a proper monitoring system can be planned and ... (i) to monitor the flows presented in Fig. ..... for the future is a network of SMEAR II-type sta-. Cerastoderma glaucum. Nematoda. Mya arenaria. Mya arenaria. â. Nematoda*. Macoma balthica. Macoma balthica. Oligochaeta. Mytilus edulis. Mytilus edulis. ing with the river discharges (PitkÃ¤nen 1994,. HÃ¤nninen et al. 1999). The main ...... fore the numbers already reflect a higher starting level. ... bour and shipyard. 1900 hrs samplings) than by night (0100 and 0700 hrs samplings). The ambient ..... E.affinis, cf. Busch and .... metabolism is about 5% to 10% of body weight. continuously bubbled with air filtered through. 0.2-Âµm filters (Sartorius ... diluted with fresh media to ensure that exponen- tial growth would ... from the same filters with Roboprep/Tracermass ...... (Emerson and Arnold 1932, Joliot 1968) and. Petrozavodsk State University, 33 Lenin Street, Petrozavodsk 185640, Karelia, Russia 2) Department of Biology, University of Joensuu, P.O. Box 111, FIN-80101 Joensuu, Finland Tkatcheva, V., Holopainen, I. J. & Hyvärinen, H. 2000. Heavy metals in perch (Perca fluviatilis) from the Kostomuksha region (North-western Karelia, Russia). Boreal Env. Res. 5: 209–220. ISSN 1239-6095 The Kostomuksha mining plant (KMP, Republic of Karelia, Russia), which is an important producer of iron pellets, is situated in the upper part of the Kenti–Kento lake– river system. In this water system, Lake Kostomuksha drains its waters through a chain of small lakes into the larger Lake Kuito and on to the White Sea. Efﬂuents from the mining plant have been deposited in Lake Kostomuksha since 1982. For this study, samples of perch (Perca fluviatilis) were obtained from three metal-contaminated lakes with different pollutant concentrations downstream from Lake Kostomuksha. The concentrations of heavy metals (Hg, Cd, Cu, Zn, Ni and Cr) in ﬁsh liver and muscle were analysed. Concentrations of Hg, Ni and Cr (1.13, 0.09 and 0.08 µg g–1 dry weight, respectively) in ﬁsh liver from the studied lakes were higher than those in the control lake, Kamennoe (0.43, < 0.001, < 0.001 µg g–1), which is not directly inﬂuenced by the KMP. In the uppermost lake, Poppalijärvi, the concentration of Hg in perch muscle and liver was > 1.0 µg g–1 dry weight. Compared to the control lake, the electron microscope study of liver tissue from perch in this lake showed an increase in the distance between hepatocytes, a decrease in the number of nuclear pores and the smallest mitochondria of all the lakes studied. be responsible for tolerance include decreased uptake, increased excretion, redistribution of metals to less sensitive target sites, and induced synthesis of metallothionein for proteinaceous metal chelation. The metallothioneins are a group of vertebrate and invertebrate proteins that bind heavy metals and may be involved in zinc homeostasis and resistance to heavy-metal toxicity. The objectives of this investigation were to study metal levels in perch liver and muscle in successive lakes downstream from the Kostomuksha mining plant and to determine possible changes in the structure of ﬁsh liver in response to heavy metals. Fig. 1. Location of the sampling sites (V) in the Republic of Karelia, Russia. KMP stands for Kostomuksha mining plant. fered from heavy metal contamination (Morozov 1998). The depository has been reported to have periods of direct overﬂow during spring ﬂoods; overﬁlling is also thought to increase the risk for breakdown of the depository wall. Furthermore, metals in the waste water have been reported to cause reduction and modiﬁcation of the algal ﬂora, thus resulting in low productivity in Poppalijärvi (Kaloogin 1991). Further studies include those of Krupnova (1995), Smirnov (1995) and Zekina (1995) concerning the effects of heavy metals on the biochemistry (bile acids, enzymatic activities, peptides) of pike and trout in the Kenti River system, and that of Vlasova (1998) on zooplankton productivity. In the lower part of the Kenti–Kento River an increase in the mineral content of the water was shown in the high conductivity values, as well as in the alteration of the natural ratio of K+:Na+ from 0.3–0.4 to 6.3. The annual concentration of K+ in Poppalijärvi was 60 mg l–1 and that of Na+ was 6.0 mg l–1. At present, due the discharge channel (Fig. 1) which has worked since 1994, the K+:Na+ ratio in Poppalijärvi is ca. 10. Owing to the high mineral content, the buffering capacity of the water has increased (Table 1). In general, the low quality of the water in this area is caused by the presence of metals, nutrients, ammonium, sulphates and chlorides (Morozov 1998, Virtanen and Markkanen 1999). investigated structure was copied onto a transparency. The monitor zooming factor was estimated to be 33.3. Because the concentrations of heavy metals were not normally distributed, statistical comparisons were based on medians and nonparametric tests, the Kruskal-Wallis test, the Tukey-Kramer test (Zar 1999) and on log-transformed data in the principal component analysis (PCA). All concentrations of heavy metals (µg g–1) are expressed on the basis of dry weight. The SPSS and JMP IN computer programs were used for statistical analyses. tissue are given in Table 4. The size of the hepatocytes as well as the size of their nuclei seemed to increase downstream from the waste deposit pond. The same increase was also seen in the size of the mitochondria and in the recurrence of nuclear pores. The maximum distance between hepatocytes was found in Poppalijärvi and this index gradually decreased downstream. Liver cells of perch from Poppalijärvi contained a large number of glycogen inclusions, the mitochondria were dense and a clear osmiophilic effect was seen on the matrix (Fig. 3). In Lake Koivas similar osmiophilic structures were present in the mitochondria (Fig. 4). A certain type of dense granules was found in the mitochondria of perch in Poppalijärvi (Fig. 3) and in Lake Koivas, the second lake of KentiKento system. In lakes Kento and Kamennoe, on the other hand, these granules were not observed in the mitochondria (Fig. 5). Fig. 4. Electronmicroscopical structure of the hepatocytes of perch in Lake Koivas. BC = bile canaliculus. For other symbols see Fig. 3.
of perch from Poppalijärvi, and larger lysosome size in Poppalijärvi and Koivas as compared with other lakes. Chromium concentration in the tissues is also high in Poppalijärvi. The light increase of Cr in tissues (Table 3) may indicate the total inﬂuence of chromium. The chromium concentration in water was higher in Ahvenjärvi, a lake upstream from Poppalijärvi; see Table 1. The highest concentrations of copper in water and in ﬁsh, as opposed to those of nickel, were recorded in the control lake, Kamennoe. The reason for this is unclear, but local geological features could be involved since unusually high concentrations of copper have been reported for till in the Kamennoe area (Koljonen 1992). Other factors behind this unexpected result could be the higher pH and a possible higher level of ligands in the Kenti–Kento system. In the Kenti–Kento system, copper and zinc concentrations do not exceed natural levels; i.e. Fig. 5. Electronmicroscopical structure of the hepatocytes of perch in Lake Kamennoe. For other symbols see Fig. 3.
changes are directed towards protecting cell viability and indicate the presence of a toxic inﬂuence in the upper part of the Kenti–Kento lakeriver system. Acknowledgements: This study was ﬁnanced by the Nordic Council of Ministers and the Russian Ministry of Higher Education. The heavy metal concentrations in the liver were analysed by Anita Kervinen. We extend our thanks to AnnaLiisa Karttunen for technical help during the histological study. The Kainuu Regional Environment Centre kindly provided us with some metal analyses from the lakes. Our thanks to Joann von Weissenberg for checking the English language. Kostomuksha]. In: [Current state of water objects in the Republic of Karelia. Result of monitoring, 1992– 1997], Petrozavodsk, pp. 134–137. [In Russian]. Zar J.H. 1999. Biostatistical analysis, Prentice-Hall International Limited, UK, 660 pp. Zekina L.M. [Zekina L.M.] 1995. [The effect of hard metal ions on bile acids composition of ﬁshes bile]. Abstracts of international conference “Biological resources of the White Sea and inland waters of the European North”, Petrozavodsk, pp. 196–197. [In Russian]. 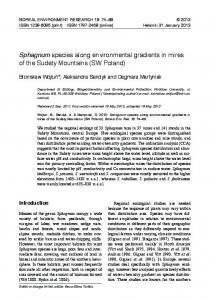 Report "Heavy metals in perch - Boreal Environment Research"